SPOILER ALERT: If you have not caught up with Seasons 1 and 2 of House of Cards, this article will contain major spoilers. Start binging. Now. Frank and Claire Underwood are in the White House. For those who have found themselves (like me) pumping their fists (defiant of their codes of morality and ethics) in support of D.C.'s favorite fictional power couple, this might prove to be a conundrum. Frank's presidency could make it hard to drum up excitement for Season 3, which will be released in its entirety on Netflix Friday. After all, what's left to achieve? All the manipulation, backstabbing and, quite literally, murder was to assume the highest role in the U.S. government. It took two seasons, but they did it. So why watch? 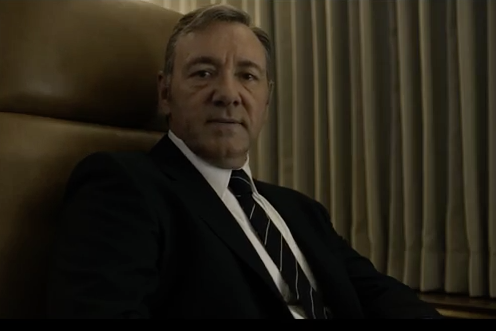 Few words are spoken in the initial trailer, but Frank's tense tone in the opening line and allusion to "holding it all together" suggests that the presidency could prove to be his greatest challenge yet. Also, it looks like we'll be seeing more from Gavin Orsay, the hacker turned FBI informant who aided in taking down Washington Herald reporter Lucas Goodwin. If that face looks familiar, it's because Orsay is played by Jimmi Simpson, aka Liam McPoyle of the McPoyle brothers from "It's Always Sunny in Philadelphia." "I'm starting to question all of it, Francis. What are we doing this for?" Uh oh. There's even more to suggest that the Underwood marriage is hitting some rough waters in this second trailer. It becomes apparent here that Frank is running to keep the presidency in 2016, but perhaps Claire is not on board. Considering that their partnership has been the only constant throughout the series, and probably Frank's biggest source of support, it's fair to say that their deteriorating relationship may be one of the most important, if not the most important, theme throughout the season. Frank: "It was like, you recoiled." Claire: "I think you're reading too much into something." Nice try, Claire, but nobody's buying it. The show released a four-part series of teasers, all of which are compiled above, entitled "Traces." These teasers tell us two things: Frank's still smoking, and Claire is probably being less than faithful. That second part isn't news to fans of the show, as both Frank and Claire have been honest to each other about their sexual exploits outside wedlock. But considering the already noted tension between the two, this doesn't appear to be the product of their strangely open relationship. Could the man on the couch be the Russian president, who locks lips with Claire in the first trailer? We'll have to wait and see. "No harm done. We take great care, obviously, to keep as much of the story secret as possible. A little bit of the story was let out but there are plenty of surprises ahead. Twenty minutes is not enough for people to have figured everything out." That spoiler: Doug Stamper is alive! Well, barely, it looks like. One thing's for sure: The presidency won't be a bed of roses for the Underwoods. Which is all the more reason to get ready for a weekend of binging.